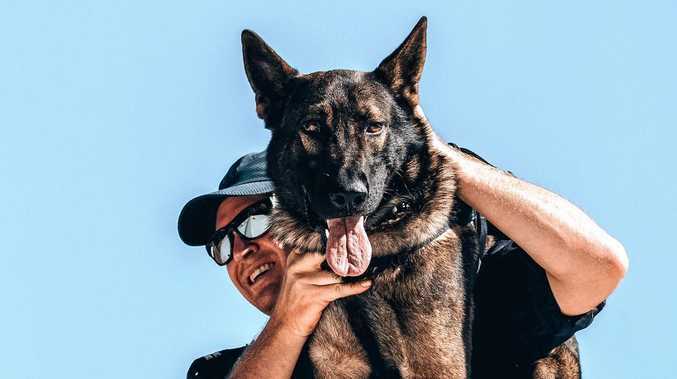 HE WAS the most trusted police dog on the Sunshine Coast, with a rare ability to go from playful pooch to hardened attacker in seconds, and Oakley's legacy is set to live on. 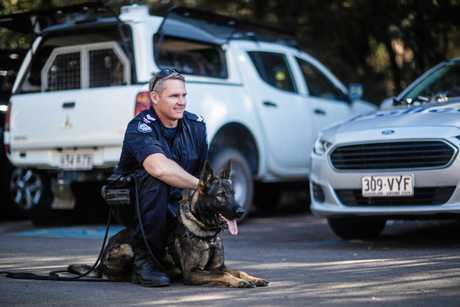 With a heavy heart, Senior Constable Trent Reynolds and his comrades bade farewell to his beloved best mate earlier this month. After a stellar six-year career fighting Coast criminals, finding people lost in forestry and being Sen Const Reynolds' sidekick, Oakley was diagnosed with cancer. The tumour on his heart slowed him down, and when he did exercise blood would pump too fast and "drown his heart". 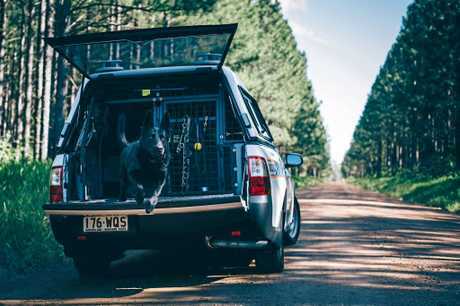 The police dog considered the "best on the Coast" was prematurely retired and housebound. Unfortunately, he was unable to be saved. His death had the boys in blue reeling and the young family of Sen Const Reynolds devastated. 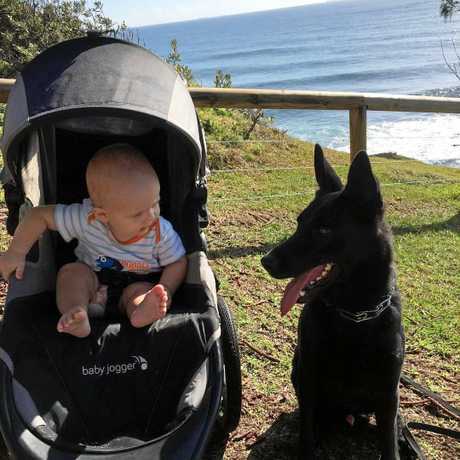 "He was the best with my little two-year-old. He'd sit and let Riley hand him food but as soon as we were out the door it was work mode," Sen Const Reynolds said. "You'd see him puff out his chest and be the boss. "Our bond was so special. He was such a good pet and friend. "You know in this role that you'll inevitably have to one day say goodbye, and it's been really tough at times. "He was so loyal to our whole family and just a natural with his work. I was very lucky." Oakley's reputation was one to be feared in the Coast's criminal circles with the pair having wiped out a fair "chunk" of criminal activity. He successfully located hundreds of offenders and missing persons which led to the duo receiving countless commendations over the years. 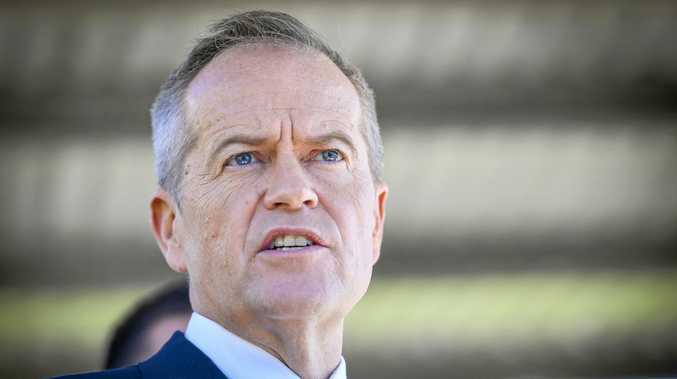 "There was this situation in Nambour in 2015 when this pair took off in the streets with rifles and we picked up the track in backyards," he said. "We'd do all sorts of jobs together. His nose was so strong." But Oakley's legacy will not be lost to the force. 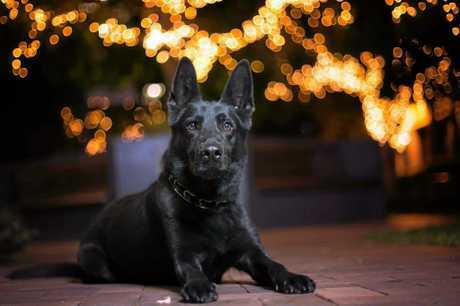 The loyal dog sired multiple litters and to Sen Const Reynolds' delight, one-year-old Darth has taken up the mantle. While there is no replacing a best friend, Darth has fitted in seamlessly, and has shown already that he could match his father. "It's nice that Darth has his father's same mannerisms, they are quite close," he said. "Darth has a little more attitude about him I think and their temperament is similar. "He has already shown to have a great tracking ability like Oakley. He is a good little dog. "I feel very fortunate that it worked out like this, not many officers are this lucky."